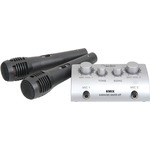 A compact, stylish unit that converts your CD/DVD player into a karaoke system to make that party go with a swing. 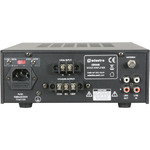 100V line mixer-amp with digital amplifier in a compact housing. 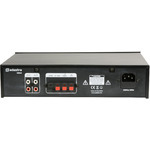 Onboard audio player accepts USB media for digital audio or can be tuned to FM radio stations. In Bluetooth mode, a smart phone or tablet may be paired with the DM25 for wireless audio playback. Mono output to either 100V line or 4-16 ohms speaker load is connected via spring terminals on the rear panel. All-in-one solution for small sound installations. 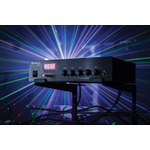 The PRO-2 MKII is a straightforward traditional two-channel mixer with a solid build quality and an uncluttered layout. 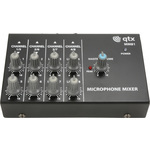 It has high quality faders, sturdy rotaries and includes a dedicated microphone input with two-band EQ and level control. 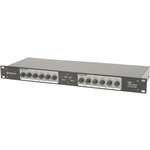 The monitor section features a rotary control to switch between channels 1 and 2 allowing the user to have a mix of both channels at the same time through the headphones. 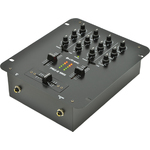 100V mixer-amplifiers with USB audio player, FM tuner and Bluetooth receiver in a half width 2U housing. 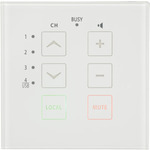 Microphone input, line input and USB/FM/BT sections are governed by front panel volume controls and a master volume. 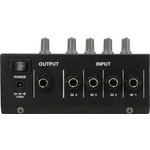 Mono output to either 100V line or 8 Ohms speaker load is connected via screw terminals on the rear panel. 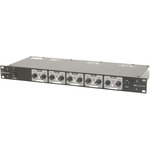 Designed as a versatile solution for small to medium PA installations.